Wow. Denis Cotter claims this is an autumnal dish. We had it on a dark April day when a bowl of filling, warming loveliness was called for. 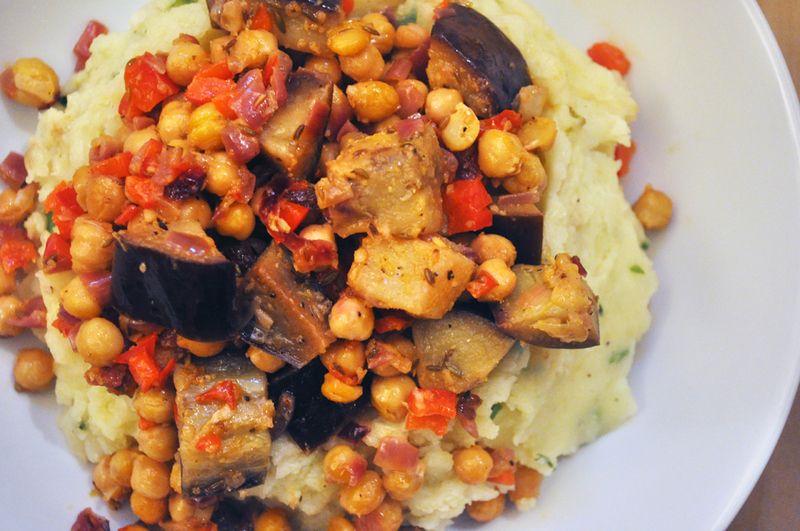 The garlic and fennel mash was sublime and a tangy topping of chickpeas was the perfect complement. We made a little too much and still scraped our bowls clean. The recipe is in Cotter’s book For the Love of Food, here. I know we plug this book intermittently, but it’s with good reason. So, no recipe here – go buy! You might not guess it from the recipe title, but this was one of those meals inspired by using up some old veg and bits and pieces in the fridge. It can also be seen as mash and greens – with bells on. For the potato cakes, steam some floury potatoes until tender (about 3 medium-sized potatoes per person), mash them and leave them to cool. While they’re cooling, saute some finely sliced shallots (1 per person) and some finely chopped smoked garlic (2 cloves per person) in a little olive oil for around 5 minutes, until soft but not browned. When the mash is cool, transfer it to a large mixing bowl and mix in the shallots and garlic. Add 1 finely chopped spring onion, per person, to the mash. The mash now needs to be worked up into an almost doughy consistency and be flavoured with cheese. Break 1 egg per person into the mash and stir in. The mash will become slightly gooey. Now, grate 50g per person of parmesan into the mash and mix well. Next, a little at a time, sprinkle some plain flour into the bowl and mix in. Do this until the flour is absorbed and distributed evenly. It will dry the mix out a little. The idea is to create a consistency that can be easily formed into a cake or pattie – without being a slop, and without crumbling at all. With your hands, shape the mash into patties/cakes about 3 inches across and an inch deep. Then fry them in a little olive oil in a wide frying pan on a medium heat, turning after around 5 minutes, until they become golden on both sides. 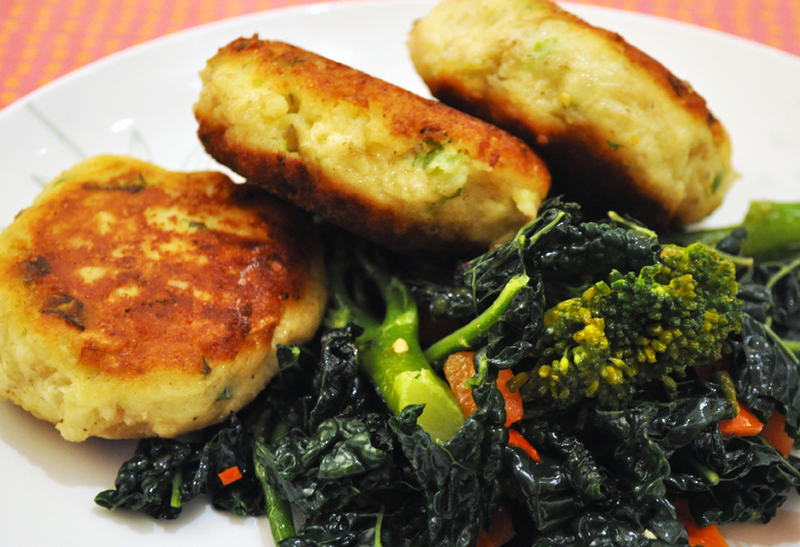 We served the cakes with some greens – blanching some sprouting broccoli and cavolo nero for 4 minutes in boiling water, then frying it in olive oil with a sprinkle of fresh red chilli and a chopped, deseeded tomato. A tangy, yoghurt-based sauce, or tomato salsa would also add a little something. We received a gift of some smoked garlic at Christmas – from the rather famous Garlic Farm on the Isle of Wight. It’s been ages since we’ve had any smoked garlic and quite frankly I couldn’t remember what we’d done with it in the past other that, well, enjoy it. For some reason I though a soup must be something in which its aromatic properties would hit the right note and, after a little internet search, I found this recipe here, from Gino D’Acampo, which is what we’ll be eating tomorrow evening. In a pickle about spring garlic? We got some new season young garlic bulbs this week. You know the ones, where the skins haven’t yet become papery and tough and the flesh has a clean delicate scent and taste. We love them in spring lettuce and pea soups – and you can pickle them. Here‘s Matthew Fort explaining how. Ful is the Egyptian dish of crushed broad (fava) beans with cumin and garlic. It’s often eaten at breakfast but actually enjoyed at any time of the day. The version Ella made was again inspired by Yotam Ottolenghi’s book Plenty (see previous post). He warns that it might not look like much but is actually rather filling. 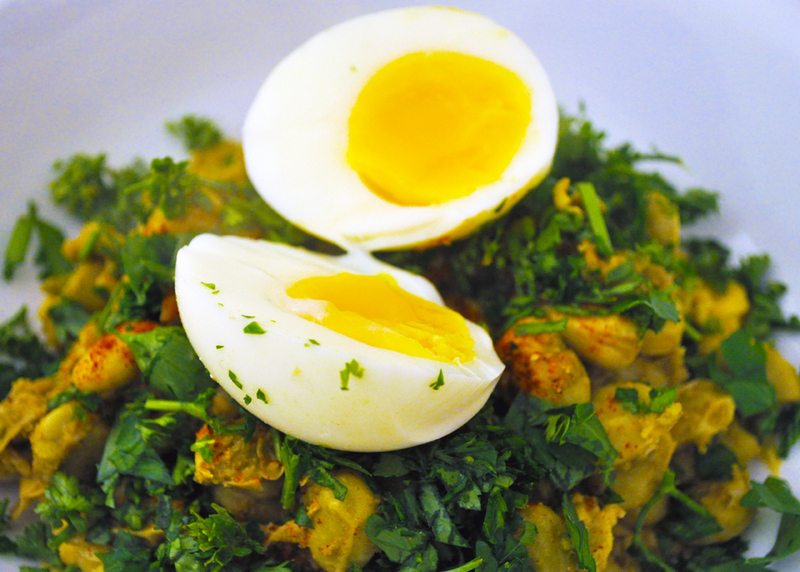 And so it should be – a big pile of herby broad beans on a bed of warm, homemade hummous and and an egg on top. That’s one big plate of protein and a rich mix too. There’s something about beans, olive oil and herbs that is heartening – ETP’s butter beans and feta recipe does a similar trick to this. Good old Ottolenghi. Recipe? There’s a wealth of them for Ful out there, but try this one here and adapt to your liking. There are a million different recipes for pisto soup. Every home should have one. 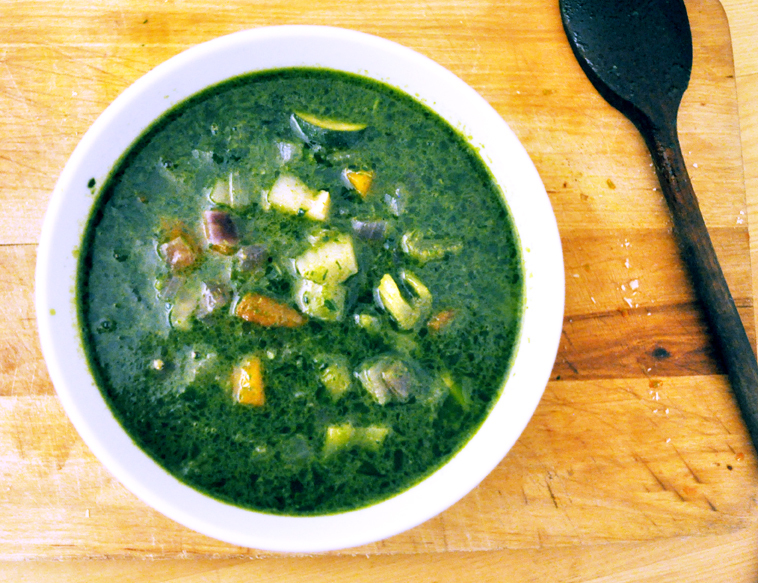 Essentially it’s a vegetable broth flavoured with pistou – a sauce made by blending basil, garlic and olive oil. The recipe we used was one from Raymond Blanc’s recent TV show – you can see it here. We didn’t add the croutons (which actually would have been a nice touch and a bit more authentic, but we were all out of bread). Personally I’d add more parmesan than I did last night and maybe use some canned beans as part of the veg – borlotti, perhaps. Erring towards the Italian, I think a small handful of black olives would also work. The soup is hugely vegetal – proper peasant stuff this, and a great way of using up bits of old veg. Ella’s rainbow salad is a big bowl of nutrition. It looks nutritious, tastes nutritious. It’s a robust thing too – and something of a pick-me-up. And it looks so lovely with the purples and oranges peeking through the green. The main part of the preparation is in roasting some beetroot and squash. We peel and chop a couple of beetroot into 2cm chunks, then do the same with half (or so) a butternut squash. Place the chunks in separate roasting trays. Sprinkle a little sea salt, black pepper and a teaspoon of ground cumin over each tray of veg, drizzle some olive oil over it and then use your hands to coat the veg with the seasoning and spice. To each tray, add a couple of cloves of garlic with their skins left on. Roast at 190 degrees or so until soft and slightly caramelised. When done, remove from the oven and leave to cool slightly. As the veg is finishing cooking, steam some florets of broccoli for around 5 minutes until just about al dente but not soft. Leave to cool for a couple of minutes. 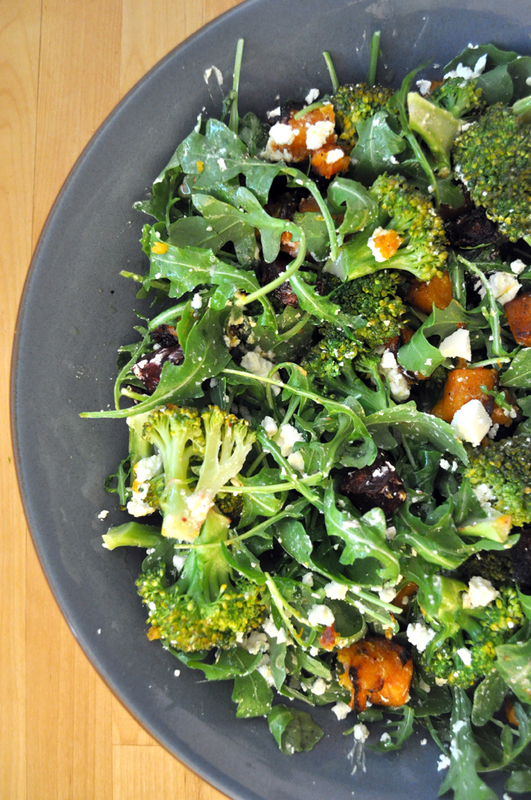 Put the broccoli, beetroot and squash in a large salad bowl and add a small bag of rocket. Crumble over some creamy goats cheese. We then make a simple dressing using olive oil, a squeeze of lemon imbued for a few minutes with the roasted garlic cloves (slipped out of their skins). Mix it all together. Some toasted seeds – sesame, sunflower etc – are also a nice finishing touch and the salad should be served at room temperature or ever so slightly warm, certainly not cold.